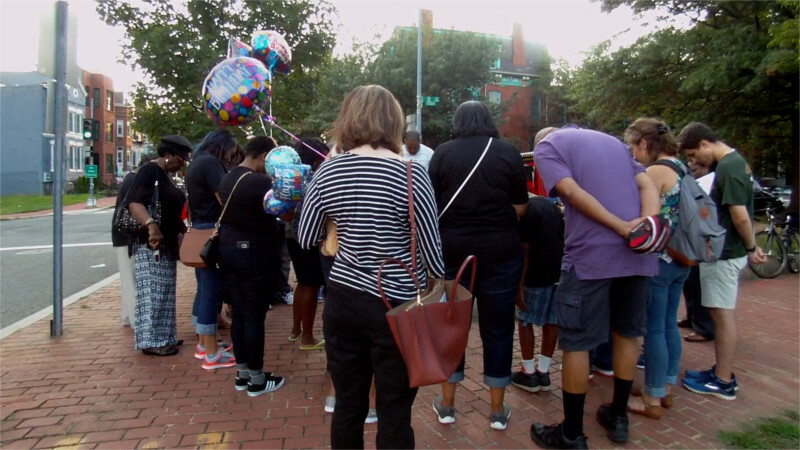 On September 11, 2016, MPD officer Brian Trainer shot Terrence Sterling off his motorcycle at 3rd and M st NW. Ever since a memorial to him has been maintained at the site, and Black Lives Matter protests took place there for months therafter. On July 31, 2017, Terrence Sterling would have turned 32 if he had not been murdered by police. Marking the occasion, his family and friends held a vigil at 3ed and M sts. Update Jul 30:Trump vows to cut off ACA subsidies unilaterally unless Congress passes a Trumpcare bill. The July 29 Our Lives On the Line rally and march on the White House celebrated the 4th defeat of Trumpcare bills in the Senate. 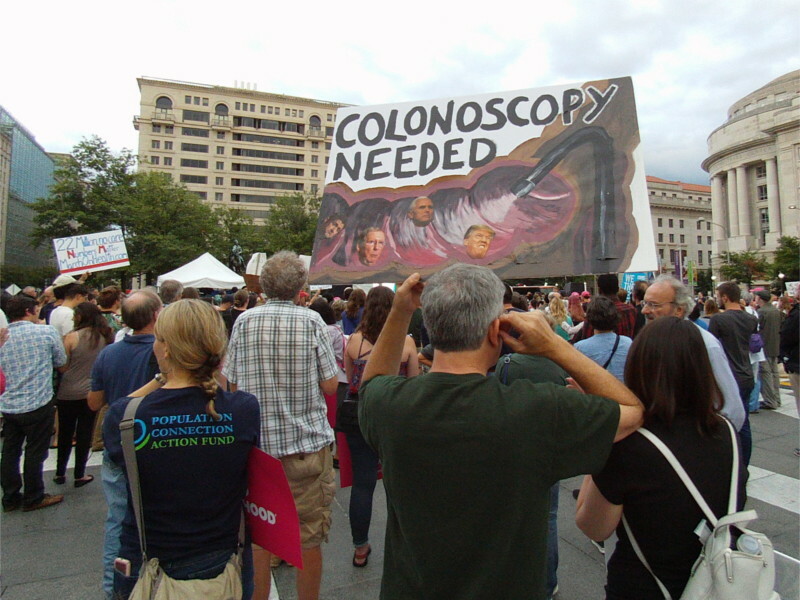 The protest also warned against any further attempts to gut medicaid and health coverage. 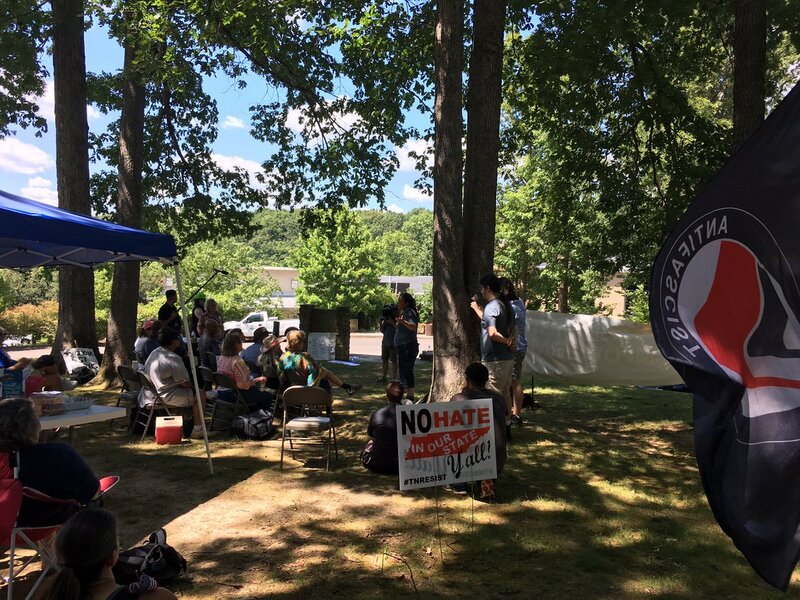 On the 29th of July, the neo-Nazi American Renaissance Conference met at Montgomery Bell State Park in Tenessee. They have been there since they were driven from Dulles and the DC area by anti-Fascist protesters. This time around, fleeing to Tenessee did not protect them. Anti-Facists protested the event, and frustrated alt-right Nazis responsed with scattered violence. A DC activist was nearly run down by a carload of Nazis, and one AMREN attendee had to go to the hospital by helicopter after he didn't do well in the fight he chose to start. 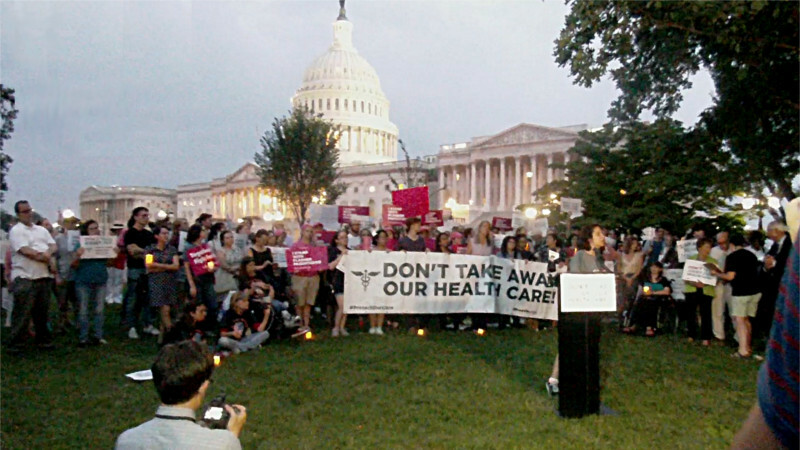 Twenty hours of scheduled debate on Trumpcare ended at 9:30PM on July 27 with protesters again at the US Capitol and no bill passed. An 8 page bill was released-with two pages dedicated to defunding Planned Parenthood. In a hurried vote beginning at 1:20 AM on July 28, this 4th attempt at passing Trumpcare was defeated by a single vote. McCain voted NO, and Pence left the Capitol in defeat. Protest WORKS! Protesters at the US Capitol chant "Shame on You!" and "Kill the bill!" The Shortwave Report 07/28/17 Listen Globally! Read more about The Shortwave Report 07/28/17 Listen Globally! On the 27th of June, DC Superior court heard a motion to dismiss the superceding indictment and compel disclosure of probable illegal grand jury instructrions. Before the hearing began, supporters of the defendents held a rally outside, including the reading of a statement by Dane Powell, sent to jail for 4 months after rescuing a child from police pepper spray on Jan 20. 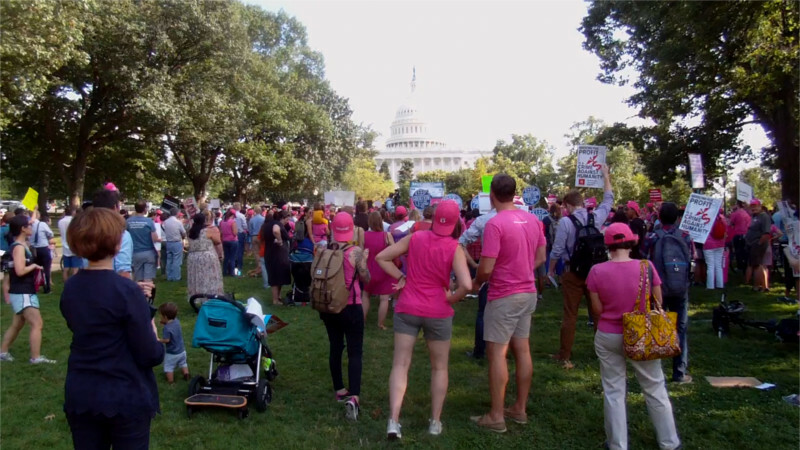 On the 26th of June, Planned Parenthood held a protest against "Trumpcare" with hundreds of supporters, many dressed in Pink at Upper Senate Park. Speakers noted that once again, all of the proposed bills boot millions off insurance, bring back pre-existing conditions exclusions-and all defend Planned Parenthood. They also pointed out that all this is to fund tax cuts for the rich. 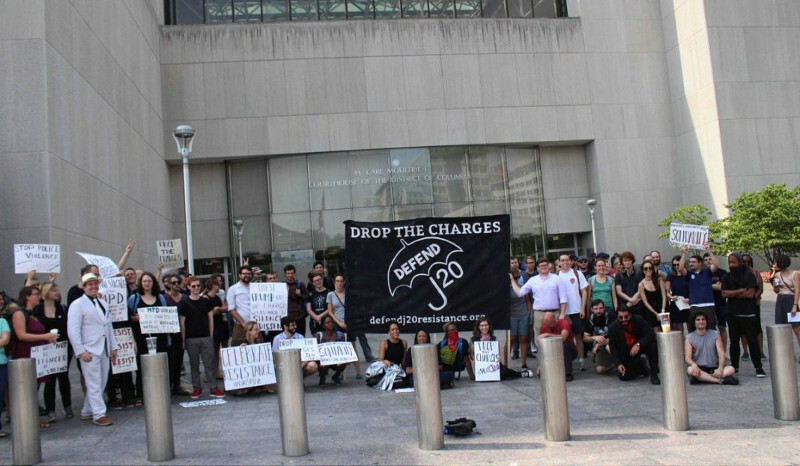 The week of solidarity with the J20 defendents continues! 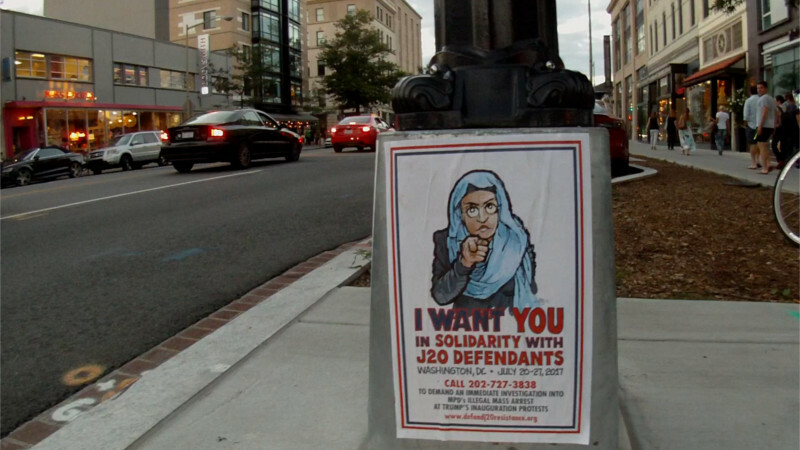 On the 25th of June, DropJ20 graffiti was visible at the corner of 12th and I sts NW, scene of some of the most intense action during Trump's inauguration. Elsewhere in town, posters appeared on lamp posts in a classic style showing solidarity with defendents who are at risk for up to 80 years in prison for protesting Trump's inauguration. Update July 25 3:15PM:Motion to Proceed on Trumpcare 4.0 passes Senate on 50-50 vote, Pence casts tiebreaker This starts the official debate in the Senate on what is being claimed to be a straight ACA repeal bill but few details are public. 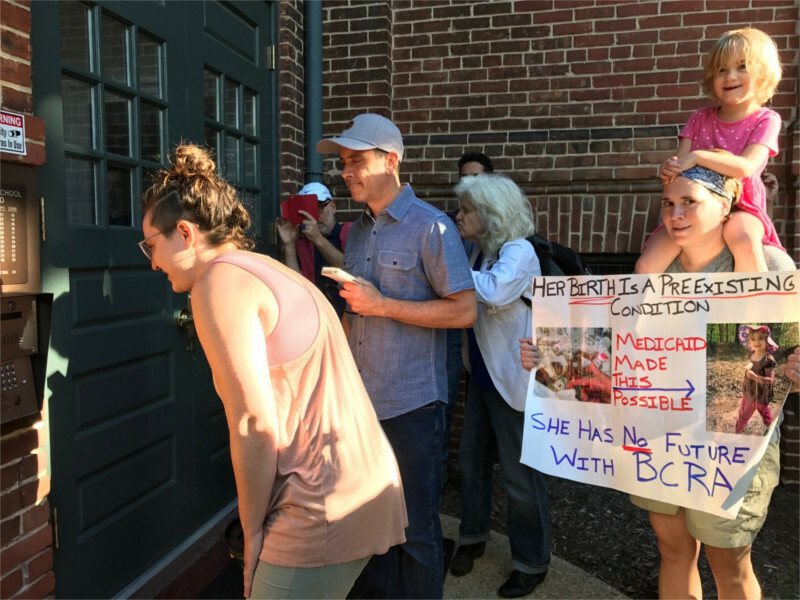 Hours before the July 25th vote on Trump's mystery 4th try at a healthcare vote, Senator John Boozman (R-AR) got an early AM protest at his home in Virginia, and Senator Rob Portman (R-OH) got a similar protest at his home in DC. One protester called the birth of her daughter a "pre-existing condition." 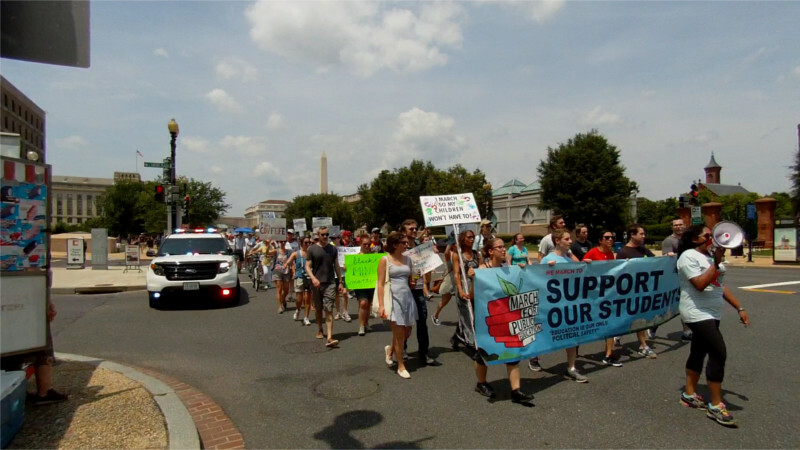 On the 24th of July, We are Cove Point and supporters showed up in Annapolis for the 5th Monday in a row of protests demanding a safety study for Dominion's fracked gas export plant at Cove Point, MD. This protest and the last few were in front of the Governor's house. 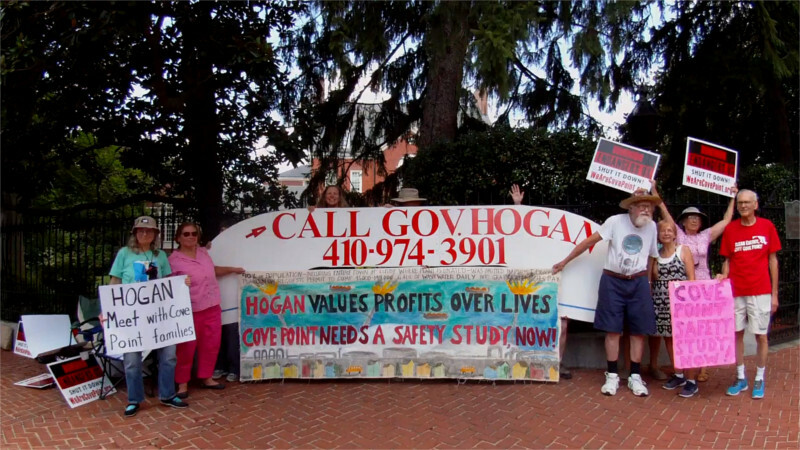 The theme this week was "call the governor" and people are being asked to call Governor Hogan at 410-974-3901 to demand the safety study. It's been six months since the violent police attacks on protesters at Trump's inauguration, and opposition to the Trump agenda is still turning people out in the streets. On the 22nd of January, a large march took over Independence Ave to oppose the corporate takeover of education advocated by Trump and his transphobic Secretary of Education Betsy Devos. Devos is a radical privatization advocate whose sole qualification for office is giving millions to Trump's campaign fund.